FROGLUBE® Solvent is a cutting edge Bio-Based product made from “USDA Certified Food-Grade” ingredients. All ingredients are produced in the USA using a proprietary formula. This product is specifically designed to work with FrogLube CLP Liquid or Paste, to provide a complete totally green weapons care system. FROGLUBE® Solvent is designed to quickly attack surface fouling, baked on or filmed residues and other metallic fouling such as lead and copper, while protecting firearms coating, paints, wood, and other materials from the corrosive effects of petroleum-based flammable and toxic weapons care products. 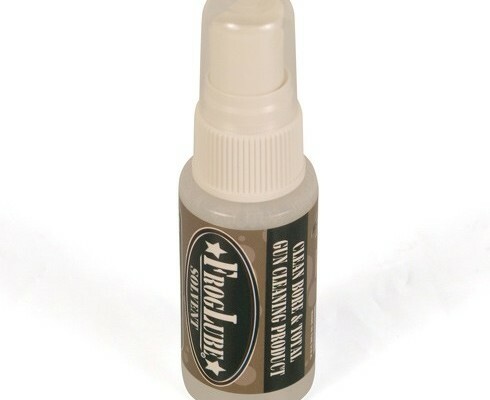 Frequent use will keep firearms running at optimal performance and not harm the FrogLube coating. FROGLUBE® Products will not harm the environment. They can be disposed of without the need for prohibitive HAZMAT controls. Users will be protected from the affects of working in and around toxic chemicals.